Thank you for your interest in coming to the End of the Oregon Trail. Our focus is to give students interactive, hands-on experience, based on the Oregon Department of Education Content Standards. 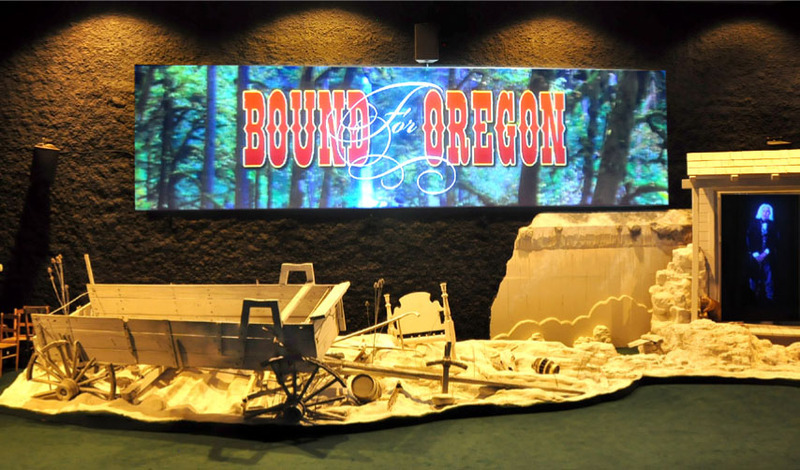 The group packages are designed to give in-depth educational introduction to the Oregon Trail experience. These packages are special programs separate from the general admission programming. Library Cultural Passes cannot be used for group programming. Interested in coming, but can’t make it out to our location? Check out our long-distance Oregon Trail Experience now offered via Skype. Interested in coming with a small group, home-school students or girl scouts troop? If you have fewer than 20 children in your group, another option is to come general public – many great activities, reservation and deposit not required. Experience the information from our presentation while walking your own trail around our new interpretive trail led by a historically clothed interpreter through a variety of signs and hands-on props. Ask us about customizing opportunities! We want your experience at the End of the Oregon Trail to be as one-of-a-kind as the group you are bringing. Help us make your package perfect for the size, age, Oregon Trail knowledge, learning style, and interest of your group. Below are descriptions of the wide variety of programming available. Please note that not all activities are available for large groups and that customizing may change the price of your package. Presentation: All packages include a presentation with a historically clothed interpreter because it’s a great place to start! In 30 minutes, your interpreter will orient your group with an interactive presentation that includes volunteers and props. When was the Oregon Trail in use? Why did people make the journey? What was the hardest part? What did a typical day on the trail look like? The presentation equips your group with the answers to these questions before moving on to your group’s other activities. Ask us about customizing your presentation to better suit your group’s age or cover a specific topic. Candle Dipping & Butter Making: Take part in some hands-on history through this activity. Students participate in real chores children their age would have had during the 1800s and get to keep the candle they make and taste the butter they churn. (Arrangements can be made for gluten allergies; unfortunately, there is no substitution to accommodate those with dairy allergies, who will only be able to participate in churning the butter). Packing the Wagon: How much can a wagon really carry? What food can we pack that won’t go bad? With this 30-minute activity, students are faced with the challenging decisions that faced the Oregon Trail pioneers. Students begin with a list of items and their weights, which they use to decide what they would bring and what they would leave behind, using math to make sure they don’t over-pack and make their wagon too heavy. After completing their list, students will learn from an interpreter what packing choices would have been best, and then actually pack their own true-to-size wagon to see for themselves the struggle that every pioneer had to overcome. Surveying and Claiming Land: What happened to the pioneers after they arrived in Oregon Country? For most, the first step was finding a good piece of land to settle on. In this activity, students experience the process of choosing, measuring out, describing, and mapping a land claim before taking it to the Land Claim Office – which was right here in Oregon City – to receive their own deed. This is an outside activity, dress accordingly. Bound for Oregon: This 30-minute film traces the true stories of four pioneers making their way to Oregon. Elizabeth Dixon Smith, John Minto, Lucy Henderson, and Joel Palmer came from different backgrounds, and were motivated by different goals, but all faced the hardships and the joys of the Trail. Hear their experiences in their own words – taken from their journals and letters – interwoven with the narration of John McLoughlin, the Father of Oregon. A different movie option is In Pursuit of a Dream about twenty-four modern-day teenagers set out on a trek along the Oregon-California Trail. They thought they’d be learning about history. They wound up learning about themselves. Chinook Trade Language: This 30-minute activity helps your students face and correct the myths surrounding pioneer relationships with Native Americans. What really happened when these two groups encountered each other on the Trail? Your students can have the opportunity to use the trade language pioneers used to communicate with Native Americans when they needed trade, directions, or help. Master Gardeners: Master Gardener volunteers are available by request to meet with student groups to talk about gardening in pioneer times and the sustainable gardening practices still used today. Presentations are tailored to the ages and interests of the group, with the possibility of a hands-on project in the demonstration garden when time and weather allow. Groups are always welcome to visit the heritage garden, which is representative of plants grown by the pioneers in the 1860s and includes heirloom roses, vegetables, herbs, and fruits. 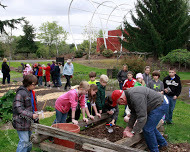 Find out more about the End of the Oregon Trail Pioneer Garden, visit the blog or the Clackamas County Master Gardeners webpage. Oregon Trail Quest: Explore the Westward Adventure interpretive trail in search of answers to intriguing questions about daily life on the Oregon Trail. This activity encourages students to read the fine print and find the answers they need in signs displaying real pioneer diary quotes. In bad weather, take the quest inside the exhibit with questions focused on the Barlow Road. Younger groups might be interested in a quest which asks students to find and identify native animal tracks in the walkways of our grounds. Journal Writing: Most of what we know about the Oregon Trail we learned from the journals of pioneers. What did those brave pioneers actually experience on their journey? What did they really think of Oregon Country when they arrived? Engage your students’ critical thinking and creativity with this 30-minute activity, which compares excerpts from actual pioneer journals and then invites students to write their own journal entry imagining what they might have thought and felt if they had lived in the Oregon Trail era. Heartstrings Music: Enjoy the musical presentation of Nancy and Rob Downie in “Heartstrings”. 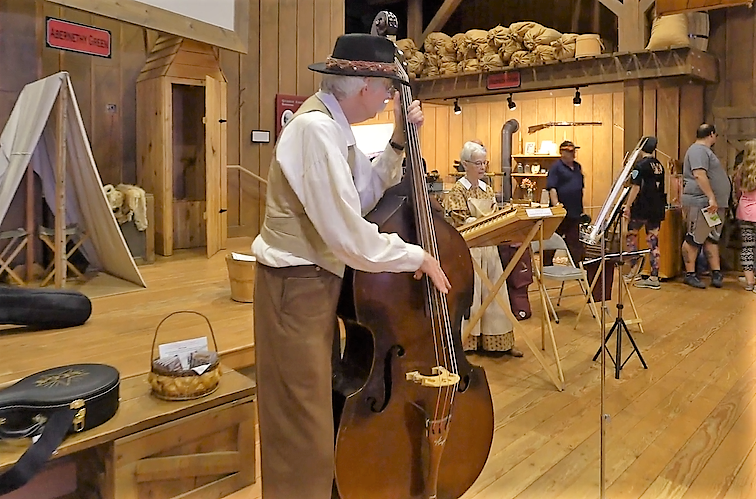 They play a variety of instruments from the Oregon Trail era including hammered dulcimer, fiddle, mountain dulcimer, Native American flute, acoustic bass, and banjo. Their 30-minute program includes a history of the songs and instruments and a sing-along musical performance (lyrics are provided) with familiar tunes such as “Camptown Races”, “Oh Susanna”, and more. Find out more about Heartstrings here. Genealogy: Why is history so important? This activity aims to ignite a personal interest in history for your students with an introduction to the topic of genealogy. The 30-minute presentation covers the legacy of families that traveled the Oregon Trail, and then helps students understand their own family’s place in history by starting a personal family tree and learning about and trying out some genealogy resources. ActiVote: Take advantage of the ActiVote technology available for groups at the End of the Oregon Trail. Students are each given a hand-held voting device that allows them to interact with the multiple-choice quiz on the movie theater big screen. Is your group studying a particular topic? Contact us beforehand and we can customize the quiz to your area of interest. Another option with ActiVote is an Oregon Trail choose-your-own-adventure where students use their voting device to make the decisions wagon trains would have faced on their journey west. How much should we pack? Should we try to ford the river ourselves? Let your group decide and see if they can make it to Oregon. To make a reservation, fill out the form below or call our main line at (503) 657-9336. A Historical Interpreter will then be in contact with you directly to help customize your visit and provide additional instructions. Due to the increased interest in our program it is imperative to send in the deposit by the due date on your invoice. If the deposit is not received, we will move your reservation to the waiting list. Email any questions to info@historicoregoncity.org or call (503) 657-9336. We look forward to seeing you!